What can and can’t we do with a baby in Vegas? First of all, you are not alone. Millions of families visit Las Vegas each year and you won’t have any problem spotting them either. Families, babies and strollers are everywhere! You definitely will not feel out of place in Las Vegas with an infant and all the trappings and gadgets that come along with family travel. I have been traveling to Las Vegas since I was baby and the tradition has continued with my own family. All my kids have gone to Vegas numerous times, starting as babies in infancy. 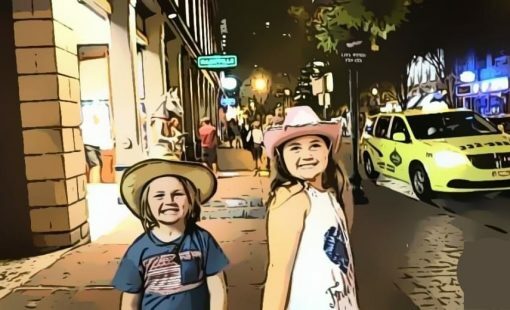 Hot Tip: If you are also visiting Vegas with kids ages 2-14, we have a ton of helpful information in our Ultimate Guide to Vegas with kids. 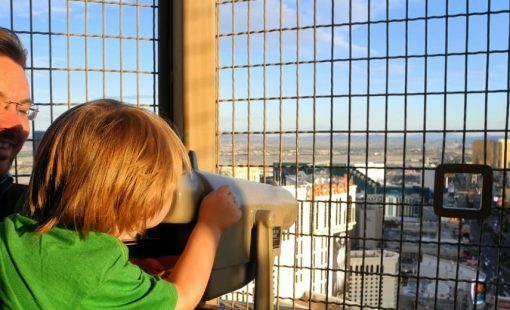 I created this article to be helpful for moms (and dads) who basically have NO CLUE what it is like to take a baby or an infant to Las Vegas. 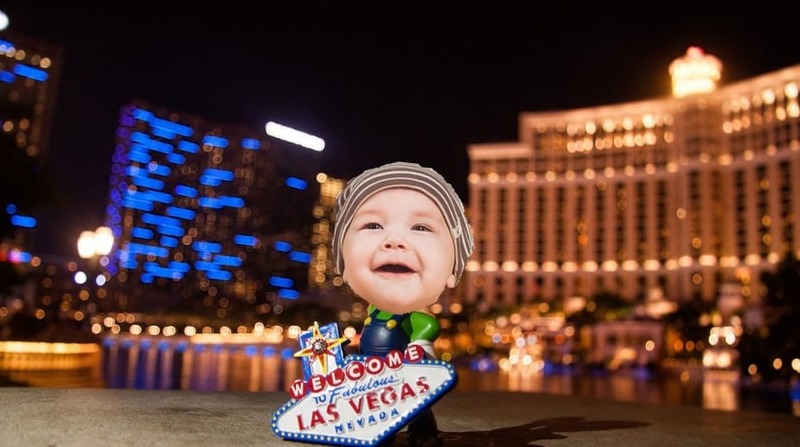 First I will answer some common questions and misconceptions that I have heard over the years about visiting Las Vegas with young kids, then I follow that up with an example itinerary that should help you get started on planning your next trip to Vegas with baby. 1.1 Q: Is Vegas Safe for babies? 1.2 Q: Are babies allowed in casinos? 1.3 Q: Where is a safe, cool place to walk with a stroller in Vegas? 1.4 Q: Are there any fun things to do in Vegas with a baby? Q: Is Vegas Safe for babies? A: In short, absolutely. Las Vegas is just as safe as most major cities, with a crime rate lower than popular cities like San Francisco and Los Angeles. In fact, most of the crime in Vegas happens off the strip. The major luxury hotel and casinos have great security and are very safe for families. From our extensive experience, my advice is to stay on the main Vegas Strip (but don’t stay out too late after dark) and you’ll be just fine. Q: Are babies allowed in casinos? A: Yes (and no). I mean, you can’t stop and gamble in the casino with your little one, but you can freely walk through the casinos with your baby and stroller. Don’t worry, you won’t be the only one either! You will be amazed at how many families will be strolling their babies through the casino right alongside you. Q: Where is a safe, cool place to walk with a stroller in Vegas? A: All the casinos along the strip are perfectly safe for you to walk your stroller in Vegas. Many Vegas resorts on the strip also have extensive indoor shopping areas and malls. Outside on the strip is fine too (weather permitting), it is just busier and may be difficult in some places to access elevators and bridges. In fact, many hotels have bridges that connect to other hotels across Las Vegas Blvd (the “strip”) and other main streets, which are helpful to avoid car traffic along the strip. Q: Are there any fun things to do in Vegas with a baby? Despite what you may have heard, there is actually very little you can’t do with a baby in Vegas. Ok, ok, you obviously can’t gamble or go to clubs or 21+ shows or lounges. But you can walk around pretty much everywhere else and explore the fun sites and plentiful shopping areas. There are numerous family-friendly Vegas shows that allow kids less than 5 years of age. You can check out an exhibit or attraction that interests you and your family. Finally, there are TONS of family-friendly restaurants located in all the major hotels on the Vegas strip. Right off Dean Martin Dr, Cracker Barrel is conveniently located right as you enter Las Vegas (from the south), making for the perfect spot to stop for a yummy lunch. The casual country dining room is perfect for families. Plus not only is the food hearty comfort food, the portions are huge and the prices are low. Eating in Vegas can pretty pricey most places, so this is a nice way to ease into the trip (and your wallet)! After lunch you can walk or drive across the parking lot to the Silverton Casino Hotel. There you will find the giant 117,000 gallon reef aquarium, where your babies and kids will LOVE watching the live mermaids swim. The mermaids are so sweet and really do great job interacting with kids, keeping them fully entranced. Mermaid swims are every 15 minutes, Thursday through Sunday starting at noon. Hot Tip: While you are there, take a stroll through the calming ambiance of Bass Pro Shop’s Outdoor World. The entrance is adjacent to the aquarium. After seeing the mermaids, it is a good time to check into your hotel. You can get your stuff up to the room, freshen up and let the baby relax a little bit. If baby is crawling or walking, this is good opportunity to let them get their wiggles out. We recently stayed at the Luxor and it was a great choice for our family since it was freezing winter and we could get to multiple hotels (Mandalay, Excalibur) easily through indoor connecting bridges. During the summer, we also really love staying at the Mirage, mostly because we love the pool. Hot Tip: If you want help picking the right hotel for your family, check out our very detailed guide on the best family hotels in Las Vegas HERE. Once you feel refreshed, take your crew down to the casino floor and explore your home for the weekend. This is a fun way to see all the exciting things your hotel of choice has to offer. You may even find a entertaining place to pop into for a quick snack or drink before dinner. Once you book your hotel, be sure to make reservations at Casa Di Amore and arrange for them to pick you up. The pickup shuttle is a complementary service and they will also return you to your hotel after dinner. Our driver (Steve) was very nice and fun to chat with. Just be sure to tip your wonderful driver for their service. Casa Di Amore is a happening Italian restaurant. This local favorite has live music, a dark cozy atmosphere oozing with old Las Vegas charm and delicious cuisine. The best part is that it is family-friendly, so you can roll up with your babies and be welcomed with open arms, wine and pasta! Once you are back to your hotel, the night is up to you. You may be tired from traveling the first night, so you may just want to call it a night. If you are up to gambling, here are some options. Travel with other adults like grandparents that help you switch off with childcare for a couple hours. That is what we typically do. We do a variety of switching throughout the trip. Utilize local babysitting services. Some hotels have in-house services or will help you arrange with an outside local company. Nannies & Housekeepers USA is a trusted company by many of the major hotels. They are licensed and insured as well as certified in CPR and first-aid. You also contact Care.com for local Las Vegas childcare. Ease into the morning with long relaxing breakfast at either the hotel’s café or buffet. It just depends on your style and your appetite. My only recommendation is to take your time and relish your first morning in Vegas. Cold Weather: If you visiting during the winter stay inside as much as possible, because baby it is COLD outside. 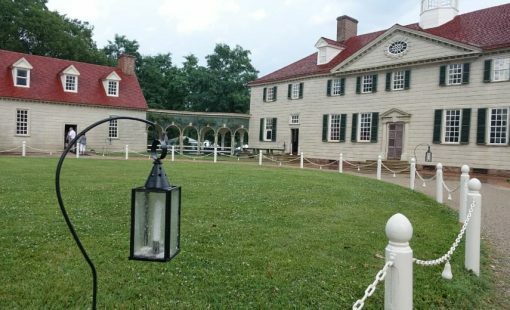 This is a great time of day to explore the many exciting shopping areas within hotels or check out an exhibit. We stayed at the Luxor and it is inter-connected with Mandalay Bay as well as Excalibur, so there was a lot to do and see without stepping a foot outside. This is also a nice feature of staying at a family-friendly resort on the Vegas Strip. Warm weather: If you are visiting during the summer or spring, enjoy a pool day. Luxor has one of the largest pools in Las Vegas, but Mirage is still my favorite. The Mirage pool also has a lot of shady spots and grottos for keeping the babies out of the harsh desert sun. MGM and Mandalay also have good pools, which you can read more about in our ultimate guide to Vegas with kids. An awesome evening activity to do with babies in Vegas is to see a pre-dinner show. Yes, there are shows in Las Vegas that allow babies. We took ours to the Tournament of Kings at the Excalibur. There is so much action going on at all times, that a loud baby will not be a bother. Hot Tip: We have carefully researched a number of shows in Las Vegas (21 to be exact!) that allow kids, and we wrote a detailed article to help you pick the right show for your family HERE. After the show, it is time to hit up one of the many electrifying Las Vegas dining options. 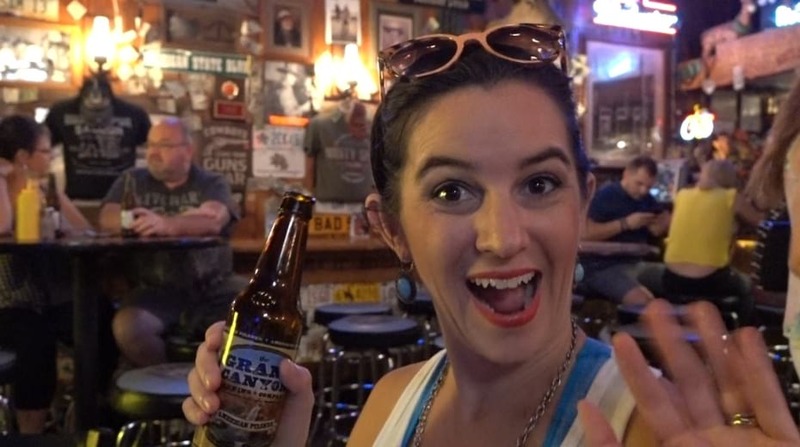 We don’t like the fun to stop, so we prefer something with live music. I recommend an Irish pub, like Nine Fine Irishmen at NYNY or Ri Ra at Mandalay Bay. They are cozy, family-friendly and the music is lively. If your baby is all good and you still have the energy to keep going here are some options for after dinner. Cold weather: The shops and many of the indoor activities will still be open, so feel free to wander around with your stroller until you stumble upon something that interest you. Some hotels even have free indoor entertainment like the Fall of Atlantis show in the Forum Shops. 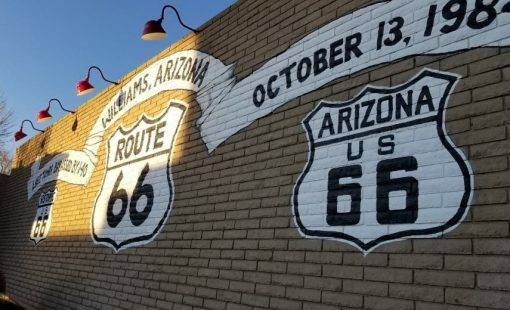 Warm weather: When the nights are warm, that is a great time to walk the strip, because city sparkles with lights and is loaded with outdoor entertainment. The main strip is very touristy and loaded with families. If you are worried about safety, I would just suggest to not go out too late. This is a good opportunity to catch some free classic outdoor shows like the Volcano show at Mirage or the Fountains at Bellagio. After two full days for activities, you will be exhausted. Time to sink into those comfy hotel beds and dream about all the fun you had in Las Vegas with baby. Vegas is the entertainment capital and there are countless ways to experience the fun and excitement of Las Vegas. I want to prove to you that, YES, it is possible to have a fun, safe trip to Las Vegas with kids of all ages – including infants and babies. 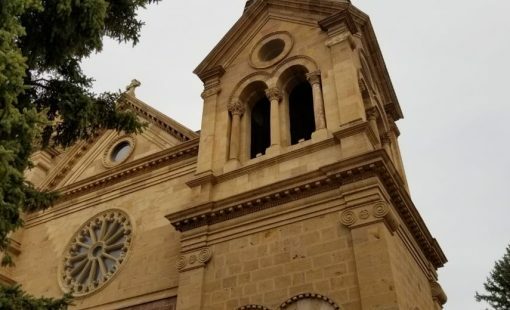 There are ample indoor places and shopping areas to stroll around in, lots of family-friendly restaurant options, kid-friendly shows that allow babies, extravagant pools, and unique attractions that are fun for all ages. Vegas can be whatever you make of it, and we have chosen to make it a family travel mecca that is unlike any other place in the world. You can too! Interesting article! I also visited Vegas once with my daughter. She was then about 2 years old and we had to rent a car with a child seat. This made it easier for us to travel and we didn’t have much trouble on the trip. Good to hear. Traffic can be hard to deal with though when your driving.